So I’m really bad at blogging on the move. Which you’ve probably all realised by now. I think it’s because when I do get a spare hour in my hotel/hostel I’m sleeping most of the time. 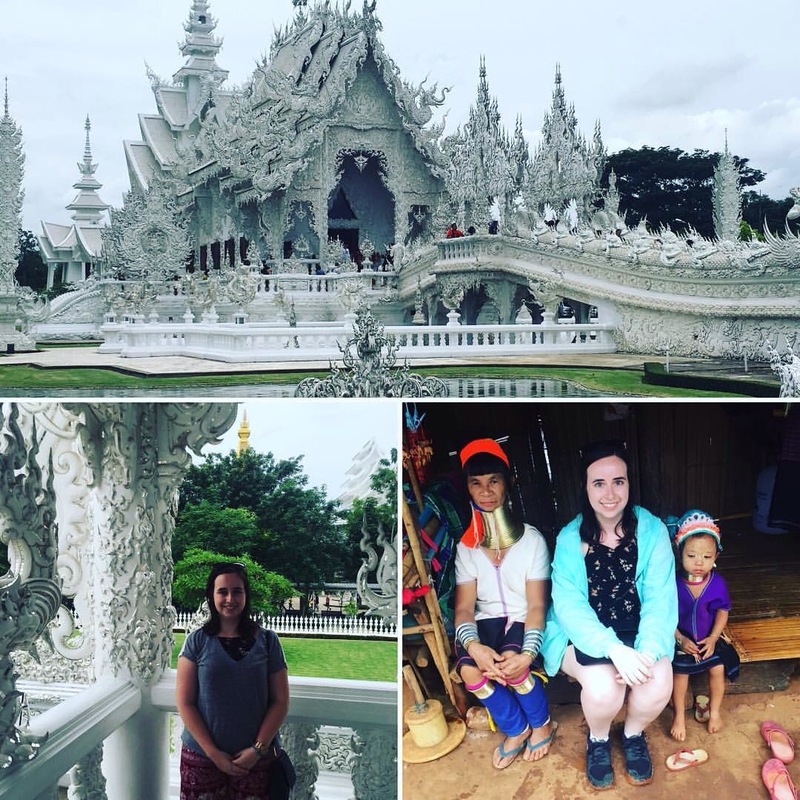 Anyway I’ve decided to condense my South East Asia trip into country specific posts (except Vietnam which will be a couple of posts because it was two weeks worth of travel. Thailand. Where to even begin. The land of lady boys and hill tribes, of glitz and glamour and the best markets you’ll come across in South East Asia. After Bangkok we jumped on a night train to head north to Chiang Mai and then up to Chiang Rai before crossing the border into Laos. The overnight train was an experience in itself! Having seen the ones that run through China I didn’t have high hopes but boy it was great. Laying in bed watching the jungle flash past in the morning was an incredible experience, even if we did get woken up at 5.30am by a ladyboy selling orange juice. We only had one spare day in Chiang Mai and a bunch of us decided to go ziplining, which was totally worth the two hour wait and slightly terrifying tuk tuk ride to get up there! Zipping through the jungle together was an experience I’ll never forget and if I do I have a free souvenir tshirt to remind me. That night we got to do a Thai cooking class, the highlight of which was watching everyone nearly kill themselves frying some chicken (pictures below). After the cooking class we went into the city to visit (more) markets (we’re embracing the hobo backpacker look and collecting bracelets everywhere we go), then to a ladyboy show! It was actually really entertaining and a lot better than I expected. 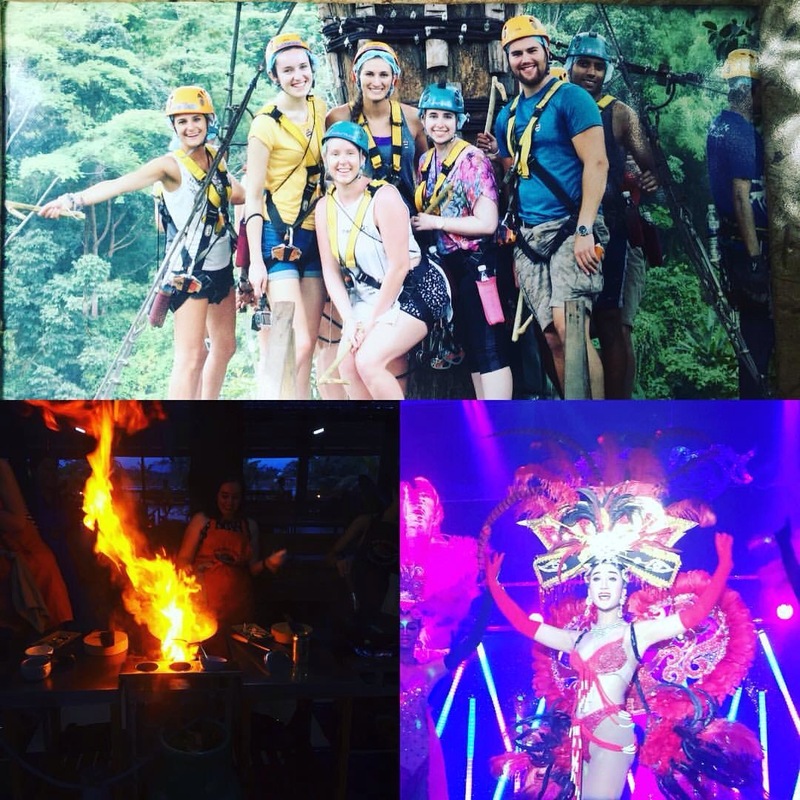 Ziplining, setting myself on fire and a lady boy show. All in a day’s work. Natalia, myself and Dani looking like pros in the kitchen. The next day we got on a coach to go Chiang Rai. This was our last day with Trip Manager Lisa before we lost her to another tour. After spending the day on the coach we landed in Chiang Rai in time for lunch before heading out to visit the Hill Tribes. I was excited to see the Hill Tribes but overall I found it a bit disappointing – it’s basically a series of markets set up for tourists to come and shop at, with a couple of performances in the middle. The whole thing feels very contrived and unnatural. On the upside it was nice to see the government taking care of the displaced tribes. After saying goodbye to Lisa we headed out to the night markets for dinner before our first party night. We rolled in around 3am ready to cross the border to Laos the next morning without a tour manager. What could possibly go wrong? Tour Manager count: 3. 1 Typhoid case, 1 stolen bag, 1 prior commitment. tl;dr: survived Thailand. Ate mango sticky rice every day. Have an absolutely awesome roommate called Dani from Gibraltar. Next Laos, Please Don’t Rush!